Havana. The throbbing heartbeat and complex capital of Cuba. A city frozen in time, but not forgotten. Different than any other destination I've ever experienced. And place I urge you to visit, before the recent embargo lift changes the face of it forever. 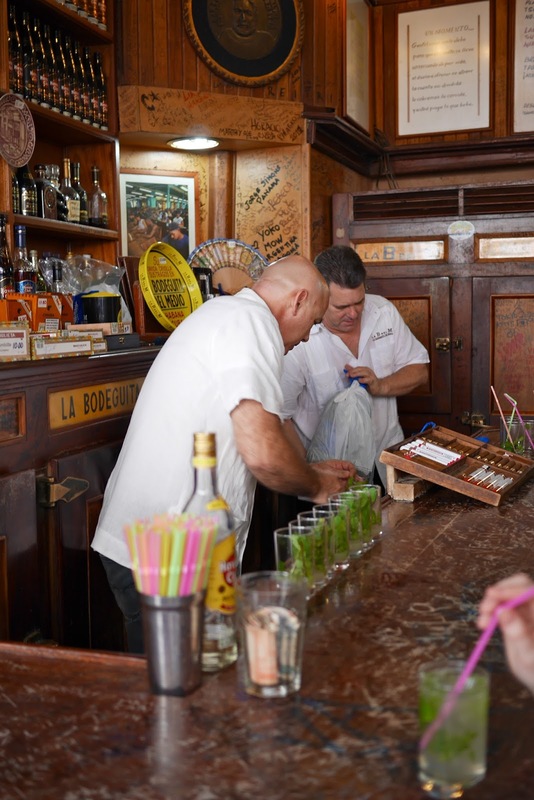 Here are just a few things to love about La Habana. Salsa, rumba, reggae, son, jazz, cha-cha, you name it. You can't turn a corner in Cuba without getting hit by an infectious Afro-Caribbean beat. And forget stereos - In Havana it's go live, or go home. No matter how small the venue, the talent is huge. What do rum, mint, and sugar cane have in common? They taste delicious together! Don't even try to keep track of how many you consume in Havana. It's been proven to be scientifically impossible. Before (or after!) the music, dancing and mojitos - take a walk down the Malecón. This 8k seafront boulevard is the center of the action on weekend evenings, when seemingly all of Havana comes out to socialize and stroll. Forget the run-down, soviet-era government hotels and opt to stay in casa particulares (rooms for rent in people's homes). Not only is it very affordable (about $25-35/night), but it also gives you an opportunity to interact with locals. For an extra few bucks, you can even enjoy a home cooked breakfast or dinner. Speaking of home cooked meals, paladores are also the way to go (private restaurants run out of local's houses). Whether it's a few chairs in someone's living room, or a full restaurant set-up in a converted garage, home-cooking beats the government run restaurants any day. You can't picture Cuba without the image of a classic car in your mind. Due to the decades-long embargo and communist regime, it's been a LONG time since they've imported any new vehicles. So they keep what they've got running, by whatever means necessary. Visiting the country is like being transported in time, especially when you experience the joy of riding around town in one of these beauties. Perhaps the only thing as iconic as the cars in Cuba, is baseball. More than the national pastime, this sport is the passion of Habaneros young and old. They love it so much, they don't even serve food and booze at the stadium (lord knows, I only attend sporting events for the hot dogs and beer)! If you find yourself there during baseball season, don't miss your chance to share in the excitement. Every city in Cuba has no less than one great plaza, and Havana is no exception. Scan your map for the many squares, and make sure to check a few off your to-do list. From open air cafes to green shady parks to gathering spots for old men playing chess - each plaza has it's own unique vibe to keep you entertained. If there is one thing Cubans know how to do well (besides dance, perform and play baseball), it's make coffee. Rich, fragrant, with a hint of sweetness. There is no better way to begin your day in Havana than sitting in your favorite plaza, enjoying a strong cup of Cuba's finest. If you're in the mood for a gut-busting bomb of carbs and cheese, peek your head into any street side stall for one of these greasy treats. Less than a buck gets you your choice of toppings on a chewy, doughy personal pie. Warning: Once you've had a few, you will never want to see one again. It's cheap. It's tasty. And it'll put you in a real good mood. No joke, a shot of the local stuff will cost as little as 25 cents in a bar. A whole bottle from the store? Two bucks. Of course an increase in quality also means an increase in price. But no matter what your tastes are, Havana Club has an intoxicating bargain with your name on it. Habaneros live life in the open. At all hours, the streets are bustling - folks walking and talking with one another, gathering on their stoops or gossiping through their open windows. The energy is palpable. For the best taste of life in Havana, just hit the streets on foot and join the fun.